MFH Amy Adams Strunk has good reason to be proud of the hunt she established more than two decades ago on her family’s 7,500-acre cattle ranch. 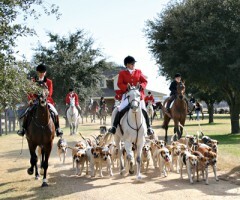 As with any foxhunting group around the world, the members of Kenada Fox Hounds in Rockdale, Texas, have amassed a wealth of colorful anecdotes and wild tales over the years. But there’s one story that Kenada members particularly love to recount: The Rowboat Incident. Kenada MFH Amy Adams Strunk and honorary whipper-in Jeepers Ragsdale were key players in the episode, which occurred on a blustery day in January 2004. As Ragsdale recalled: “We had a pretty large field, and we were having a great day. The hounds had been after a coyote for about 3 miles, and eventually they ran it into a stock pond. The pond had an old rowboat floating in the middle of it. Fortunately, all of the hounds were OK, except for one that we later discovered had been bitten by a water moccasin [poisonous snake] while it was in the lake. Exciting days are hardly rare for Kenada Fox Hounds, however. The ranch they run on, a commercial cow/calf facility owned by Strunk’s father Bud Adams, is mostly wide-open country with low trees and minimal brush–affording unusually long and ample views of game, which in Kenada territory is strictly coyote (although a few fox have been spotted, along with a proliferation of deer, feral hog and 1,200-head of unfazed cattle). The result of such openness is an abundance of long, fast runs on any given hunt day, in pursuit of up to six different coyotes over as many as 26 miles. Riders seeking a leisurely pace and moderate action need not sign up for a day with Kenada, although all comers are warmly welcomed with legendary Texas hospitality. More than 50 jumps (mostly coops) ranging from 2’6″ to 3′ dot the gently rolling countryside on the ranch’s 7,500 acres. An additional 8,000 acres on hunt-friendly neighboring ranches is available to the group, although most of the game seems content to stay on Kenada property, according to Strunk. Kenada’s roots trace back to 1983, when Strunk—who grew up as a ranch kid riding western—was working on her newly acquired English riding skills at a hunter/jumper barn in her then hometown of Houston. A lifelong player of many competitive sports, Strunk was intrigued when a barn staff member described the sport of foxhunting to her. Strunk began reading everything she could find on foxhunting, and her growing enthusiasm spilled over to several equestrian friends as well. In January, the group decided to attend the annual meeting of the Master of Foxhounds Association of North America, held in New York City. “I was there to try to learn all I could about foxhunting,” Strunk explained. Strunk steadily developed her operation, with charter members continuously coming on board. In 1986, Kenada Fox Hounds achieved recognition. Today, Kenada is one of six recognized hunts in Texas. Kenada’s season is fall through early spring, and the hunt goes out on Saturday and Sunday. Combining permanent on-site stabling with a scattering of paddocks, more than 50 horses can be accommodated on a hunt weekend. Most of the 40-plus members (who largely haul in from the cities of Houston, San Antonio, Austin and Kerrville) stay in their own RVs near the barns. However, a nearby hunt house—complete with a large kitchen and gathering room–can sleep up to 30. The Kenada pack consists of 30 couple. “I like to breed one to two litters per year,” Strunk said. Strunk keeps her field hunters on the ranch where she lives, in Waller, near Houston. It’s a relatively short drive to Rockdale, where Kenada is based. Strunk is engaged to be married to the coincidentally-named Bill Hunt, a commercial pilot who gamely follows the pack in his truck and helps with coyote sightings using a two-way radio. Strunk is sometimes asked what elements set Kenada Hunt apart from most other hunts. “When we started,” Strunk explained, “there was no tradition for foxhunting in Texas—so we’ve had to kind of evolve over the years and educate people on what foxhunting is, how much fun it is and the tremendous camaraderie involved. But we’re mostly different in that ours is an entire weekend event; we all converge on the ranch on Friday and stay through until Sunday afternoon. Lt. Col. Dennis Foster of Virginia agrees. In his position as executive director of the MFHA, Foster has hunted with 382 packs in 11 different countries, including several times with Kenada, through the years. “I would rank Kenada right up there with the best,” Foster stated. “It’s a great little hunt, one of the best-kept secrets in America. Amy Adams Strunk is the Annie Oakley of Texas: She can ride like the wind, and she’s fearless. Amy does just about all the work herself, although the people who hunt with her are devoted to her and they pitch in whenever she asks. Strunk is pleased to note that other guests have had similar impressions. Speaking of family, Strunk is hoping that one of her three children–the one who inherited her passion for horses and sport–will some day take over Kenada’s reins. That would be 14-year-old Blanche, who began hunting with Kenada at age 5 and was already whipping-in at age 9. Strunk’s older children are Tracey, 21, and Tommy, 19, both of whom hunted a bit in their younger years but are now in college preparing for non-equestrian careers. Strunk, 55, is immensely proud of all three but has pinned her hopes for Kenada’s future on her youngest. “Hopefully, Blanche can take over some day when I end up having to follow the hunt in a Jeep,” said Strunk with a laugh. Strunk’s love of the sport and the lifelong friends who’ve evolved from it will likely keep her in the saddle for years to come, however. Ragsdale shares Strunk’s self-described addiction to foxhunting. The owner and co-director of Camp Stewart For Boys in Hunt, Texas, Ragsdale has been a Kenada member since 1993. “I just love it,” said Ragsdale, 41, “all of it. Kenada has great hounds, a great master and staff and very large country full of game. It’s a first-class operation and hard to beat. Kenada is just plain fast–real fast, sometimes, which is what makes it so fun. Honorary whipper-in Linda Ray Myers has belonged to Kenada from its inception. Myers, a veterinarian, breeds field hunters on the farm near San Antonio that she owns and operates with her husband, Kurt. Like Strunk, Myers recognizes the importance of passing down Kenada’s traditions and involvement to the next generation.